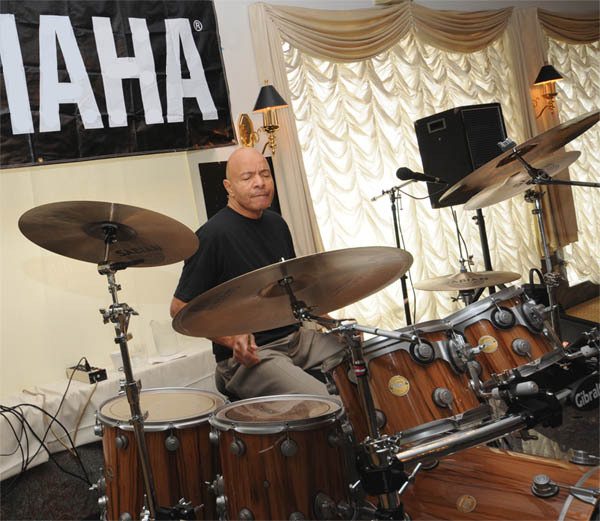 When we last spoke to Chester Thompson back in 2002, it had been a decade since the Genesis touring line up of Tony Banks, Phil Collins, Mike Rutheford, Daryl Stuermer, and Thompson had hit the road together. That being said, Chester was anything but retired in their hiatus. The latter part of this decade has certainly been a memorable one for Thompson. 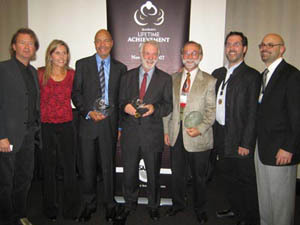 Not only was he honored with Lifetime Achievement Awards for his drumming from Sabian Cymbals and at The Percussive Arts Society International Convention (PASIC) in 2007, but he also reunited with his former bandmates in Genesis that year. A world tour culminating with one of the band's biggest performances ever - a show in front of an estimated 400,000 people at the Circus Maximus in Rome, Italy. 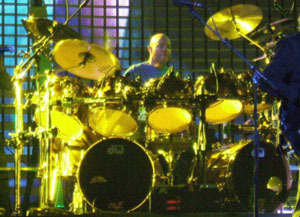 In September 2009, World of Genesis.com's own David Negrin sat down with Chester Thompson - just miles from where Chester had performed with Genesis two years earlier, in the shadow of Giants Stadium. 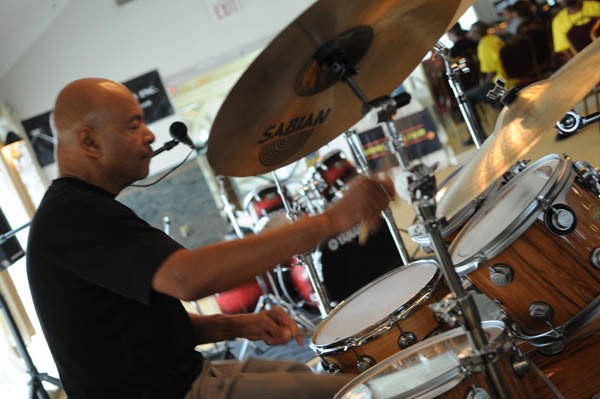 Thompson was in town as part of the Slammin' Symposium, a drumming clinic in Wayne, New Jersey. Chester sat down to talk about his forthcoming solo album, session work, his interest in teaching, and the newly released Genesis Live 1973-2007 box set, Genesis' 2009 nomination into the Rock N' Roll Hall of Fame, and much more. WOG: Speaking of different shows, the Circus Maximus show in Rome had to be one of the most memorable shows you have ever done on the tour. Do you have particular shows that stand out to you as being among the more memorable? CT: For me, the Rome show was one of the most memorable, because it was probably the worst one (laughs)! We had had three days off on the road. I mean, can you imagine… Since you are a Philly guy, imagine the 76ers [basketball team] going on the road and hitting a nice winning streak. Suddenly, they’ve got a few days off. Then, they come back and they have to play the Lakers. So, in a good way, it was memorable because it was such an event. I mean, the energy of those people in the audience was amazing, but we hadn’t played together in over three days. So, it wasn’t the tightest we’ve ever been. Obviously, you want it to be as good as we can get it. So, while one part of me remembers this incredible event with hundreds of thousands of people, the other part of me thinks, “Man, we messed that up!” (laughs)! World Of Genesis: I understand that you have a new jazz ensemble project? Chester Thompson: Well, yes and no. I mean, I’ve been doing some stuff. I’ve actually been invited to do some jazz festivals… I’ve just done one in Tennessee with some people that I play with. I’ve been invited to do some other stuff, but it’s an awkward time, because I’m in the middle of a semester. I teach at Belmont University, and I’m free to come and go, but I have about 19 students right now. So, when I miss and I need to do make-up lessons, then two [lessons] times 19 students is 38! Oh man! (Laughs)… It’s getting there… It’s always been a part of what I’ve done, but I’m just not fronting it. I mean, I love arranging and doing all of that, so it’s nice having that outlet. WOG: Are you doing standards or original material? CT: I do some originals and some standards I guess, but I don’t do standards in a standard way. I do take some of the classic jazz tunes and totally twist them around and do other things with them that the [original] composers might not have appreciated (laughs)! CT: Has it been that long?! WOG: Yes! Time flies (laughs)! WOG: Well, thanks to the invention of editing and some great mixing by Nick Davis, the show appears to have come across perfectly on DVD (laughs)! CT: There you go (laughs)! WOG: With the release of the new Genesis Live 1973-2007 box set next week, have you had any input into the new stereo or surround mixes? CT: No, I haven’t, actually. I’m not really in the loop for that sort of stuff. I don’t hear it before anybody else. I mean, if I called them up ahead of time and asked to hear it, I’m sure I could, but my life has been really busy and, to be honest, I didn’t even know it was coming out next week until you just told me (laughs)! …But I will absolutely call [a representative from Genesis’ management company] and say, “Hey, can you send me a copy?” Which they do, thankfully. WOG: Phil’s talked about his physical condition recently in the press and his inability to play drums right now. Do you think that reduces the chances that Genesis will ever reform to tour again? CT: I take him at his word that he’s done with it. He’s done. I really think he means it. He’s got those young kids at home, and he’s loved all of his kids, but I think this time he really wants to be more involved in their lives than he’s been able to be in the past. It wouldn’t surprise me if one summer he decided to go for it and do a few shows and bring his family with him, but both of his kids are in school now. It’s a different story and a different time. I wouldn’t even dare try and predict it. It might happen, but I don’t think it will happen in the sense that the band is reforming, you know? There might be another small tour at some point, but I’m certainly not holding out for it. I mean, obviously if they call, I will be there. I think it’s been a great run. I’m part of the history, but I’m also a fan of the music, so I hope it does happen, but I take him at his word that it probably won’t happen. CT: Yeah, well, funding got interrupted and all of that… So, what’s ended up happening is that I’ve recently picked it back up, which I have. I actually decided that I didn’t like very much [of the new studio material from 2002] anymore (laughs)! So, it was back to the drawing board. I’ve actually been writing some new stuff, some of which I really like. I mean, I love melodies, and people keep reminding me that anything that I put out that people will expect to hear drums on a lot of it, you know? (laughs). Which makes me think, “Aw, man!” …because part of me hears these melodies from a composer’s perspective. When I’m playing stuff with somebody else, I like to just sort of go for it! So, I’m trying to find that middle ground where I can find the right songs and still sort of go for it. It’s taking longer than I would have thought. I moved, basically. I had a really nice studio in my old house. The housing market being what it was, things really didn’t go as I had planned. So, I still haven’t completed a new studio yet. It’s amazing how spoiled you get when you just have a place where when you have an idea, you can just go down there and do it. I’ve got a way to work, but it’s just nowhere near as convenient as what I had before. CT: I never really got to record with either of them. I basically got to tour with them. Their records had already been done. The one time I did record with McDuff, the trumpet player in the band played pretty out of tune in that session so they couldn’t use it. Tracks weren’t quite so discrete in those days where you could actually completely isolate it and remove it. You pretty much played live in the studio. So, those recordings never came out. WOG: Is the jazz trio style more along the lines of what you expect to do with your next solo project or are you trying to steer away from the drums a bit more with that album? CT: No, I’m not trying to steer away from it. My problem is that I’ve done so many styles of music, and I love so many styles of music. I mean, one of my passions is listening to and playing Brazilian music. I love Brazilian music! I’ve played with some Brazilian artists and really learned a lot about it, but I still kind of do it my way. I’ve grown up playing jazz all of my life, and I love doing that. I love slammin’ and I love stadiums and just going for it! I love all of these styles, but you can’t package all of that into one thing. It’s not marketable. Those that would have to market it, won’t appreciate that, you know what I mean (laughs)? I understand that. I want to do stuff people will listen to. I don’t want to do stuff just for me that nobody can get into. So, I think it will be kind of more along the [jazz] fusion lines, but something with some serious grooves that people can dance to. I mean, just because that’s what drums are, they are about rhythm. WOG: I noticed your official website hasn’t seen much in the way of change in the past several months. WOG: Are there any plans to update it in the near future? CT: Yeah, it’s funny. I keep saying I need to get to that. The lady who designed it for me is in Iraq doing stuff with the military. When she’s doing that, she can’t do anything outside of that world. I know how to do some things to it, but basically when the Genesis Turn It on Again tour ended, I hit the ground running. Between my other projects, my own album, teaching, and my family life, it’s getting neglected. It definitely has. I’m talking to someone who is apparently a very astute web developer. She has an interest in doing it, so [you should see it updated in the future]. Obviously, if [my current developer] gets back from Iraq and has an interest in doing it, would love for her to continue doing it. I’ve learned that I don’t multi-task well. I try to get that right and then move on to the next thing. I need more RAM! LOL! WOG: When Phil [Collins] starting doing his big band project in the late ‘90s, knowing your roots in jazz and how the drum duets with you and Phil have been a big part of the Genesis tours since the ‘80s, I kind of thought that one day you two would do sort of a [Buddy] Rich versus [Max] Roach kind of an album one day. CT: It’s interesting you thought of that. That never even occurred to me. It’s funny, because that is an album that we both listened to growing up. I think that was really just his break from doing all of the usual stuff. That was his outlet to get out that thing he’s been enamored with all of his life. I mean, the duets were practical for Genesis obviously, and it kind of finely spilled out to his 2004 tour last time around... I guess he did it with Ricky (Lawson) [on the 1994/95 Both Sides Tour], but we hadn’t done it before. It’s an interesting idea. It never even occurred to me that he would go there… which he didn’t (laughs)! CT: It has become so, yes. WOG: … and it seems even more so in recent years. Do you get more satisfaction out of working with young percussionists than you do going out on tour? WOG: What are your thoughts about the recent Rock N’ Roll Hall of Fame nomination? Have you heard about that? CT: I’ve not heard anything. You’re telling me stuff! CT: Well good! They should be. Absolutely, they should be! WOG: As a rock band that is considered a “fan’s band” and a group that is typically not loved by the media or members of the music industry for a large part of their body of work, what does this mean to you knowing that its voted on by members of the music industry? Do you think Genesis would embrace this nomination? If so, do you think an induction into the Hall of Fame would possibly entice the band into a one-off performance at their induction ceremony if selected? CT: I would think that they would perform at it, yes. I mean, they’ve always loved to play. It’s not like they don’t love to play or perform. Would they embrace the nomination? I’d be surprised if they didn’t embrace it! If you’re in this business and you’ve seen the kind of groups that get nominated, I would think they would be quite honored. CT: I knew nothing about it. I had no idea. It’s actually the first I’ve heard of this! WOG: I heard you worked on a session with Brad Cole, Daryl Stuermer, Lee Sklar and some of the other guys from Phil’s solo touring band for a project with Paul D’Adamo for his forthcoming sort of original solo project/Genesis-Collins tribute? CT: Yes, I did. Brad Cole asked if I would play on some stuff he was producing, so I did. Paul’s a singer who really wanted to do some Phil stuff, but there are some originals I think he’s doing for this project as well. I’ve not heard any of it, but the tracks turned out really good from what I have heard from Brad. CT: Oh no, no, no, no… I love teaching, but nothing comes before playing. I love recording, but playing to an audience is my favorite. That’s absolutely still my favorite thing to do. I do really enjoy teaching. I mean, life is about seasons. There is a season for one thing and then there is a season for another. I think you kind of learn to make your peace and learn to enjoy the season you are in. Then, you can look forward to the next season when it comes or you can prepare for the next season. It’s not really an either/or type of thing. Timing works out where there is a time for this and a time for that. I’m glad it just kind of naturally flows that way. It’s not like I have to choose one over the other. I can do both. I feel fortunate that way. WOG: When did you first start hearing about the plans for the 2007 Genesis reunion tour? Were you surprised when you got the news that the band was getting back together? It was meant as a joke, but not really. I was just one of those things. We have these three guys who formed this band way back when, and we’ve got these two guys who get hired on, but man when we walked into that room – we were a band. No doubt that it was a band. Anyone who had any doubts, when we saw each other … I think it was so overwhelmingly good to see each other, we realized what a kinship there was. That’s my take on it, anyway. I can’t speak for anybody else. WOG: Did you have any interest in album production yourself? CT: It’s not something I’m particularly gifted at, actually. WOG: In terms of working with Daryl, I understand you guys met back around 1973. He mentioned that he felt he first connected with you musically at a place called Sardino’s Bullring? CT: (Laughs) Oh, that was way back in the day! Daryl had a really great band (Sweet Bottom). It was this local club, and they were this great, great local act. I don’t think it happens so much anymore, but back in those days, there were certain bands and certain clubs… If you were on the road, you would just sort of sit in and jam, because you knew it was a good band and a good club for it. Sardino’s was one of those places and Daryl had one of those bands. It actually grew to become kind of a scene as musicians would tour through Milwaukee. That was where we first met. It was my second gig with [Frank] Zappa. Daryl’s whole band was coming to see the show, and we happened to all meet up in the drum shop, and we just started talking. "I would think that they would perform at it, yes. I mean, they’ve always loved to play. It’s not like they don’t love to play or perform. Would they embrace the nomination? I’d be surprised if they didn’t embrace it!" CT: Well, that’s happened in Europe before. Not so much in the States, but there were tour posters back in the day in Europe that featured all of us on the posters and stuff, but more so this time… Definitely it was more prominent than ever before, absolutely. CT: Man, this past tour was the best ever! We spent all day ever day laughing. It doesn’t get any better than that! WOG: How about musically? Did that click quickly or did it take some time to get back in the groove with each other? I think we all enjoyed the process, and I think everybody liked working hard to get it right, and we did. I think we reached a point in the rehearsals where we needed an audience to get to the next level. It’s such a process that it’s hard to put a specific timeline on it. WOG: As you may know, they are reissuing a remixed and remastered version of Tony Banks’ first solo album, A Curious Feeling. Having already toured with Tony twice by that time for Wind and Wuthering in 1977 and And Then There Were Three in 1978, how was it different working with him in the studio versus working together on tour with Genesis? CT: Yeah, I did know about the reissue of A Curious Feeling, but I’ve not heard it yet. For the making of that album, probably my fondest memory... I remember hanging out at his house. I stayed at his house to rehearse. So, you naturally see a very different side of someone in their home. Everyone is much more relaxed at home. It was a really good time, actually. It was a lot of fun. CT: (Laughs) Yeah right, I saw that! I guess I was more of a child prodigy than I thought (laughs)! WOG: Typos aside, do you think Chapter & Verse was a fair and accurate representation of the group’s history? CT: I think so, yeah. It’s the history as they tell it. I read through my part of it. What’s your take on it? CLICK HERE TO GO TO PAGE 2 OF THE INTERVIEW. CLICK HERE TO RETURN TO THE INTERVIEW INDEX.